Iraqi Christians: "Obama abandoned us"
The Christian community in Qaraqosh, Iraq, the latest town to be freed from the Islamic State described how ISIS persecuted them by forcing them to pay an enormous tax, convert to Islam or be executed. Many who survived the terror and returned to the town now voice their outrage at President Obama for refusing to protect them from the Islamic State when they captured Mosul and the Nineveh Plain two years ago. 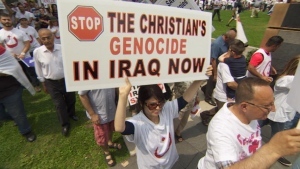 A man in the village of Qaraqosh told reporters, “Obama has never helped the Christians. In fact, he despises them. In the last 26 months, he has shown he despises all of them. A Catholic priest from the town also said, “The US government led by President Obama could have protected us- or at least helped us to protect ourselves. But unfortunately Obama abandoned us, and chose not to get involved. Many Iraqi Christians have voiced their support for US presidential nominee Donald Trump because they believe he will make more of an effort to help Christians suffering in the Middle East. The liberation of Qaraqosh comes as Kurdish-led forces fight to free Mosul in Iraq and Raqqa in Syria, two of the Islamic State’s largest strongholds.